We’ve already published a blog post about the 1968 Prague Spring, so this time you will learn what happened after. Those travellers, who participated on our special Communism & Bunker Tour, not only had the unique chance to visit a creepy nuclear shelter, but also to greet the Patron Saint of Czechs, King Wenceslas, who’s statue overlooks the Wenceslas Square. It is believed that King Wenceslas will come back in times of a danger and save the country. That’s why people always come to Wenceslas Square, if they need to protest or celebrate something. Naturally many revolutions happened in the Wenceslas Square, including the 1989 Velvet Revolution or students manifests against the Soviet occupation known in 1968. It is believed that the King Wenceslas, the Patron Saint of Czechs, should safe the country from the danger. That’s why people always gather bellow his statue in the Wenceslas Square and “call for help”. He never showed up, obviously. In 1968, the first state secretary Alexander Dubcek gave people hope in better future and tried to establish socialism with human face, while pressing for more freedom under the Eastern Bloc and a few liberal changes were made in the program of the Czechoslovak Communist party. But most importantly people’s thinking has changed, when they realized that they can freely express they true opinions even the mainstream media! It was unbelievable! We have to consider that the previous decade of 50s, is called the era of fear, during which manipulated trials were common, people were being hanged, political prisoners were locked in working camps mining uranium with bare hands and paranoia became part of normal lives. Until late 60s, when people could finally taste little bit of freedom thanks to the young active politician, Alexander Dubcek. Well, the Prague Spring started with great hope for better future, but ended with tears. Czechoslovakia was occupied with troops of Warsaw pact (Soviet Union, Poland, East Germany, Hungary and Bulgaria; Romania refused to come) over night of 20th to 21st of August, 1968. It was Leonid Brezhnev who decided about this brutal act, which Soviets called a help with fighting against the capitalism. More than 100 people died in the streets of former Czechoslovakia. True help indeed! Then the comrades in Moscow decided to make Czechoslovakia “ normal” again, so the times of Normalisation slowly begun. 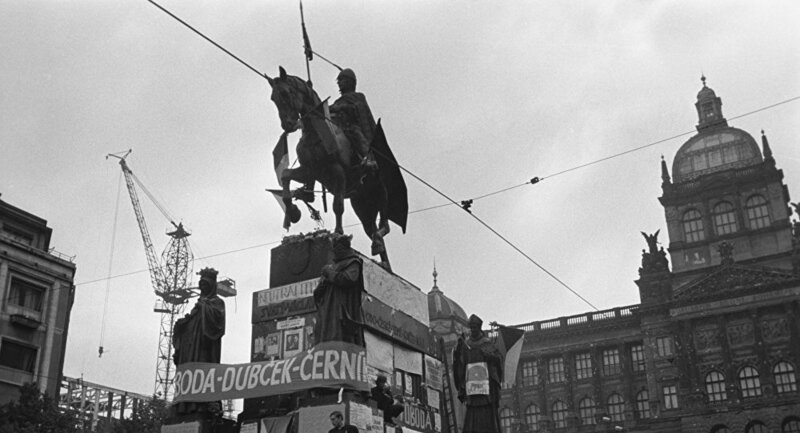 One year later, on 21st of August 1969, people met by the riding statue of King Wenceslas and started to manifest against the Soviet power. Again. Well, this time it was not Soviets, who stood against the crowd, but Czechs themselves. The troops of people’s army known as Milita arrived to get rid of the gathering. The fighting unites were composed of non-professional soldiers, who were not trained to deal with such stressful situations and acted under the pressure inadequately using the brutal power of weapons and machinery. Imagine rather older tired man wearing helmets and guns, beating the young people and showering the crowds with water blasts. Riots have begun and the ideals were again suppressed. The regime announced the state of emergency and the Federal Assembly issued the safety precautions for restoring public order. The former leaders of 1968 Prague Spring were pressed to sign the arrangement. Even Dubcek has turned his back to the people and his democratic ideas. What a disappointment many people had to experience when they saw Dubcek’s signature there. They lost their faith in better future and gave up. Because of this moment people started to be very apathetic and passive. They bought pieces of land in the Czech countryside, built their small wooden cottages and escaped here with feelings such as “I cannot change anything myself” or “Public affairs do not interest me anymore”. So people start to care about themselves and their families mainly. The state also motivated people to make children and focus on family life rather than travelling or freedom of speech. The era of “normalisation” just began… The dreams about freedom vanished, the will to change things gone and the hope in better life died… until 1989 when the communist regime finally collapsed! Czechs finally got their well deserved freedom, but their live experience remain. Now we have democracy in the Czech Republic, and we still work on it. And man, it is a hard job! I often hear people saying (especially in the countryside) that we are just a small nation and cannot change much. I believe that the nation is slowly gaining self-confidence back, because younger people start to be more active, open-minded and cheeky than the older generation. Let’s hope that one day, the whole nation will symbolically rise its head and proudly say, we are brave nation who can change the world!